When was the last time you were in the thick of an amazing idea? We are SO SO time poor. Or whatever the phrase is. However, where there’s a challenge there’s hope and a creative mind gives life to something potentially outstanding. So good friends and co-conspirators in making the world of work better met socially last night (20 August 2015) and discussed how much we like to read but don’t find the time we would like; how much we enjoy others distilling what they’re read and experienced and sharing it quickly. We got on to the amazing thing that is an Ignite sessions. 20 slides at 15 seconds each, autoforwarded by PowerPoint. We said how much fun they were and a really great challenge to be succinct but meaningful. The BOOM – the amazing mind of Paul Taylor said “how about 10 slides at 10 seconds. A presenTENtion”. And so it was born. Come see us try out this new format on 16.9.15 (16+9-15=10) for 10x 10×10. It’s a funny phrase that – “never look a gift horse in the mouth”. It apparently has its origins in Olde English with a Latin Phrase that preceded that even. 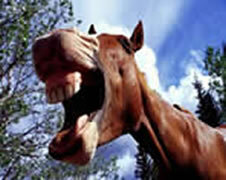 It was essentially saying, “Never inspect the teeth of a given horse” i.e. when gifted a horse, never look in its mouth to see if it it growing new teeth and therefore whether it’s younger or a more mature nag. Just be grateful you’ve been given a horse. What are the three words and the gift horse I speak of? Talent; Reward; Productivity. Yes there’s technology, and data, and innovation, and change, and climate and all sorts of other things that are the megatrends of now but the three words Talent, Reward, Productivity cropped up in several unconnected conversations with HR, Charitable, Academic and Leadership professionals with me over the last few weeks. Whether or not you agree these are utterly crucial factors in the world of work and success factors in the now and the future, it was uncanny that all three kept popping up as themes. So I’m going with them as crucial based on that circumstance that has had me thinking for over a week now. Talent – people with skills and adaptability that you have to find, attract, retain, tool-up, deploy and let loose so they grow your business into success. There is no war though, just a series of campaigns, search/seek/secure missions and so on. What IS clear to me is that talented people, working to their strengths and supported, valued and inspired to perform often leads to successful organisations and more joyful ways of working. Reward – because it’s not about pure cash or benefits of a fiscal nature any more. It’s a smorgasbord of things that can be anything from social recognition to private messages of appreciation – whatever they are, they’re important. To everyone. Cashing a paycheck is no longer what many people are about as much. Fulfilment and purpose – even as Dan Pink called it transcendent purpose – are critical factors in the reward pot of the now and certainly the future. Productivity – that enigmatic factor the Government of the UK is so obsessed with. Ultimately, something that denotes how effective, lean, credible, satisfying, channelled, repeatable, and the creation of an edge that determines whether we’re toiling away under the myth of efficiency or whether we are actually making a difference and getting real value from what we do that benefits the entire nation and the world even. A war on waste. Wasted effort that is. 3 crucial factors that may in themselves or collectively determine whether a company survives in this ultra competitive and challenging world of business we find ourselves in. HR’s gift? These three words are professional areas that form part of the HR portfolio and therefore a real chance to prove credibility, trust and belief in a viable part of a better future of work. A chance to be taken seriously. A chance to show the profession has a real impact on success and a chance to stand up and be counted. Why wouldn’t we want to be the custodian of these vital elements of work? Under confident, under developed and under pressure to perform are perhaps factors where some might feel reluctant to take the challenge before them and look that gift horse right in the smacker. Except of course, those who are caring, confident, game-changing HR professionals. It’s a gift they’ll not return and ask for a credit note on. if we (in HR) get Talent; Reward and Productivity right, there’s hope for a better working proposition in the future. Hope that HR will become a highly sought after professional avenue. A chance to restore humanity to the sciences of motivation, work and continuous improvement. A chance to give people a hopeful, energising future. And where we resist the temptation to scrutinise the dental elements of an equine endowment. A big chance to get the most out of big data? Human resource analysts collect and study information related to jobs, issues and costs that affect their companies. Many HR analysts use human resource information system programs. HRIS is a computer software package that helps these professionals manage their data more efficiently and accurately. HR analysts are usually required to have bachelor’s degrees in business or human resources. Required skills include analytical, communication and organizational abilities. There’s something interesting occurring in the world of Human Resource Management. The numbers are really starting to count (pun intended). People – whilst enigmatic, unpredictable and imaginative – also create patterns in data about them, around them and in the things they say and do. HR Analysts are being given a lease of life because the data about people is really, really useful in making decisions, plotting progress and changing dynamics. It’s been in the consumer world for years: analysing browsing and buying habits; the science of retail outlets physical layout and the ultimate moment of truth in making a purchase. We’re now seeing how this move into the world of employees and people at work. Many of the most successful organisations in the world have a great employer brand and what’s now being labelled the employee experience. There’s something about reputation of the brand being largely the consumer/customer perspective but now also the employer/organisation perspective. Culture really does eat strategy for breakfast when it comes to prospective employees making the decision to apply or stick with your company. So the shift from not just the product and price but the buying experience in consumer parlance has shifted to the employer world – not just the salary and the role title what does it feel like to work there? HR Analysts should be able to capture data about the employee experience; store it; retrieve it and then analyse it. They should then be able to discern patterns and trends, conclusions and test hypotheses from the data and then report on them using visuals, dashboards, infographics, models, narratives, storyboards, animations and even in a recent scenario, a 3D printed visualisation. HR Analysts will be able to research, ratify and report on qualitative and quantitative studies. Invoked by them in response to external trends, factors or issues OR invoked internally by business leaders and employees alike. HR Analysts will know how to run data through a prediction or scenario and have some data-based results at the end of it (within or without a technology platform or tool). HR Analysts will take disparate data from a range of formats, sources and constructs and make sense of the “mashup” of information. HR Analysts will know how to elegantly present information as the result of the analytical process which will either support or challenge decisions, approaches and strategic direction. HR Analysts will create richer, deeper and more useful data sources and continuously improve the way data is collected, collated and used. HR Analysts will advise others on the use and interpretation of people, performance and development data. HR Analysts will be able to map self-sourced data with data sets and reports from other research bodies and institutes. HR Analysts will have excellent interpersonal and relationship management skills which will facilitate even greater understanding, utilisation and upkeep of people-related data. HR Analysts will be able to process map and workflow model based on data or gleaned knowledge of roles, practices or disciplines. Overall we believe the HR Analyst “app” will create value through the enhanced utilisation of information and datasets, which will strengthen the decision making and predictive scenario planning aspects of the HR / People elements of the business which will add considerable certainty, rigour and reliability in adapting, making changes and improvements to the employee value proposition and organisational culture. We will know this is successful through improvements in staff satisfaction, more accurate recruitment and selection of people to positions and lowered absence and attrition levels, positive customer feedback and bottom line increases over time. The HR Analyst role has a vital, specialised and developing role in any successful, progressive and business-like HR function. 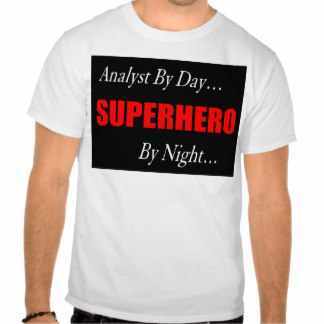 It’s time for the rise of the HR Analyst. Before those of you less in touch with empathy, emotions and endearing thoughts about your fellow human beings click away from this blog, I’d urge you to just stick with me for the next few hundred words. Life throws a lot at us and we make of it what we can, what we will and what we want. And yet there are times when we don’t really stop and think about what makes us human. I’m not about to go all existential, unnecessarily spiritual or emo-blogging on you. Yet there’s some amazing things we really really must try and absorb, understand and revel in. I’m going to talk very personally here – not to attract comment for me as a human being but to highlight how much things mean to me and therefore might mean to you and perhaps more importantly other people. Before I start though, it’s tough isn’t it? Being a nice, gentle, generous, thoughtful, calm, patient, considerate, helpful, wise, approachable, warm, comforting, real human being isn’t as easy as it could or should be. Guessing what people’s agendas are. Worried you’re being taken for a fool. Anxious you’re not appreciated. Concerned people might think your intentions aren’t good. Lacking confidence in your decisions because others frown or roll their eyes. Feeling marginalised because of whatever reason appears in your mind. Having to explain yourself why you’re being gentle and not shouting the odds. Getting the cold shoulder because what someone wants from you, you’re not able to give them. However 5 times over the past week I’ve had cause to feel overwhelmed by human kindness. Before the 5 it reminded me of a voicemail from a friend, collaborator and all round good person who left me a voicemail just saying how much he appreciated me, what I do and what I stand for. I can hear those words now. It was unprompted, appreciated and so gently powerful. That person knows who they are and what that meant. I hope it made them feel as good as it made me feel. On a professional note, I’ve had the pleasure to talk to many of the amazing organisations part of the WorldBlu freedom centred workplace approach. Rich, Bruce, Garry, Amy, Linda, Michael, Carrie, Trip and of course Traci Fenton as CEO of WorldBlu, all say the same thing: Being democratic, freedom-centred and alternative is hard. It takes a lot of effort to humanise the workplace. It goes against the orthodoxies we currently have – no matter how toxic, fear-inducing and boring the current ways may be. So onto the 5 things. A trusted friend and collaborator thrilled at a new opportunity that’s coming my way and shared their view on me. It choked me. I had a few tears. Sat in a coffee shop in London. I held them back. It was lovely to hear such genuine words about what you hoped you were but you’re never really sure. I reciprocated – not out of duty but because I genuinely admire, regard and care about this person. It inspired me to draft this piece. An email (oh how I don’t like those generally) from a health care worker. I don’t know them. We talked about an area we’re both interested in. We found kinship. I read 3 sentences and realised how lucky we are that people like this woman care deeply about human beings and want to devote their professional career to the care of others. And THEN want to make sure it’s not overtaken by bureaucracy and crazy regulations and can be improved, humanised. A text message from someone who’s got engaged. So lovely to hear of their happiness. That’s a normal thing though isn’t it? Not when they put all the words of support for me on a new venture of mine BEFORE sharing their massive life event. They wanted to share their excitement for my thing before they told me theirs. I was humbled. It made me feel that person’s warmth, realness and genuine support for what matters to others. Lovely moment. And the fourth one isn’t even a response – it’s a hope. I have offered free help to an Interim HR Director in a Children’s Hospice. I am constantly reminded that you can do all you want for clients, teams and colleagues in any field you like but when people are working in the care of people – especially those tiny people – who face certain death that has to be something we should all want to do. I might need some help with this and it’s not even something defined in terms of what that help might be but I hold onto this as something I desperately want to do – not to gain plaudits but to do the right thing by another human being who I’ve not even met. Lastly and most significantly someone’s put their trust, hope and business aspirations in me. And been as human, honest, trusting, open, generous, excited, warm, sincere and welcoming. I am going with this based on every ounce of my soul saying “this is right; not for mistrust but for appreciation, professionalism and belief”. It’s such a show of human instinct, faith and soul that I’m still a little bit “out of body experience” on it but I am loving every moment of that feeling. Now to deliver but lets just say that the perfect starts bodes well for a continuance of applied effort, energy and outcome. So is it really tough being human? If we’re all so human and “nice” won’t we just accept more poor treatment from others and those manipulative, devious, miserable others just take advantage? I’m not advocating we all go naively into our days and having expectations shattered. I am saying that the emotion in us all is a guide. It’s an indicator of what’s right, what gives us humanity and what saves our souls. Yes our guile might get us the job over that other guy from the other team. Yes our cleverness might dismiss those foolhardy bandwagoners jumping on the latest management fad. Yes our commercial acumen means we have that bulging bank balance and the title and the corner office. But that doesn’t make you a successful human. Maybe a successful job holder. Those things are admittedly tough to achieve but won’t move people to tears in a coffee shop on a Tuesday morning. They’ll probably make people sneer, shake their heads or worse pity you if you success is at the expense of your fellow humans. 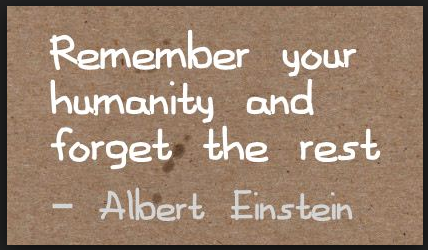 I’m proud to work in a profession that starts with the word Human. Yes it’s partner word is Resources but I can see past that. Being human is tough. The right kind of tough. The toughness we need a lot more of. Thanks to Meg, Rachel, Clare, Phil, Siobhan, Gaylin, Miranda, Ada, Lisa, Gareth, Becky and countless others who remind me of the humanity in us all, in the world and in my soul. I’ll leave you with the fabulous Brene Brown and her TED talk on Vulnerability. Please be human and proud of it folks.